This no-fuss Cheesy Chicken Tortilla Soup is quick to make, incredibly flavorful, filling and garnished with crushed corn tortilla chips! I’m on a roll this week sharing my favorite dinners. I have had this soup and the Meatball Parmesan in my dinner rotation for quite some time now (yes, I was holding out on you) and I’m finally getting around to sharing them this week. New year – new dinner ideas! If you’re anything like me, you can’t look at another dessert after all of the holidays we just had. Give it another week, I’m sure I’ll be over that. It also doesn’t help that my birthday is so close to Christmas (today) and that means MORE cake and MORE desserts. There could be worse problems in the world, right? Mr. Wishes got me a vanilla cake with white chocolate butter cream frosting and raspberry filling to celebrate my birthday this past weekend with family. It was to die for! Then he got me a small fruit tart to enjoy throughout my birthday week – I am eating like the fattiest of the fatty fat pants this week. 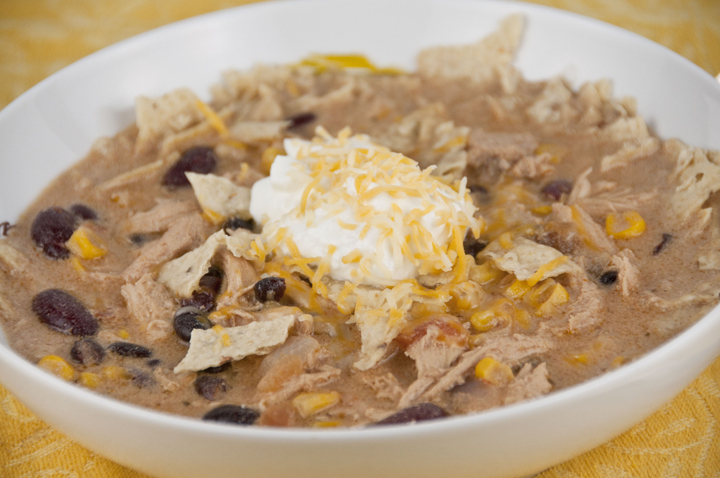 I have made this chicken tortilla soup several times and everyone absolutely loves it. I have used a rotisserie chicken once which made it a very quick and easy weeknight dinner. If your New Year’s resolution is to cook more dinners at home, I highly recommend adding this one to the list. It’s the best Chicken Tortilla soup I have ever had, including soups that I have had at restaurants. 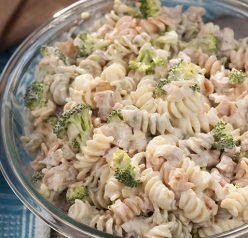 This one is creamy, chunky, and full of flavor. This soup makes a LOT, so this is perfect for a big family or if you’re a fan of leftovers the next day. I am one of those people! Leftovers are the gift that keeps on giving. Enjoy! Add the garlic and the onion and saute until softened, 5 minutes. Add the flour and stir well, cooking for 1 minute more. Add the broth and the half-and-half. Stir in the cream of chicken soup, salsa, chicken, beans, corn, cumin and fajita seasoning. Continue to simmer over low heat for 15 minutes. 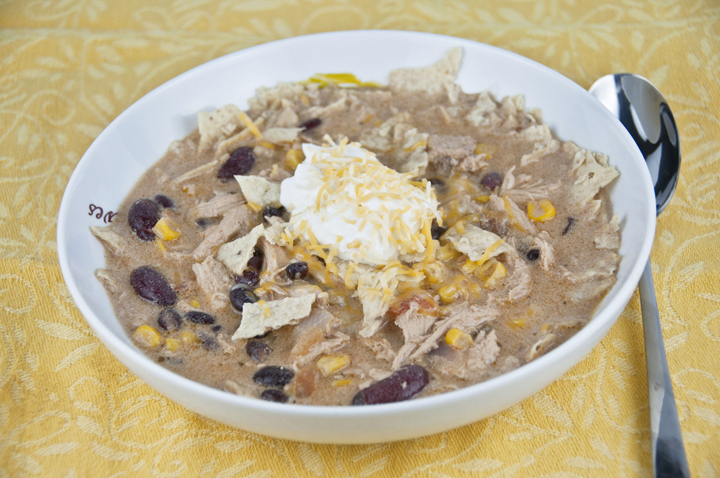 Crumble the tortilla chips into individual bowls and top with a ladle of soup. 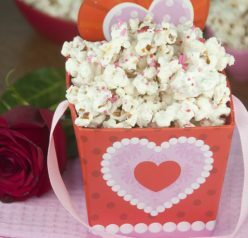 Sprinkle each serving with cheese and add a dollop of sour cream. I hope you feel better soon, Eva! Mmmmmm I love soups like this! YES! Keep the desserts and gimme a bowl of this awesome soup!! P.S. HAPPY BIRTHDAY!!! I hit enter too soon! Enjoy your day! I’m the same way…I can’t even think of eating dessert right now! Chicken tortilla is one of my family’s favorites and this version sounds wonderful. I am hoping to make chicken soup tonight and adding beans and corn would be a splendid idea! One of my ALL TIME FAVORITE comfort foods. Oh yum – I can totally see why this is one of your favorite recipes to make. Perfect comfort food! Happy Birthday!! Oh, I LOVE chicken tortilla soup. Yours looks so deliciously heartwarming. I loved that you used a rotisserie chicken. 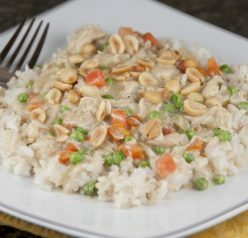 Best quick weeknight meal ever! Tortilla soup is my absolute favorite kind of soup – and Happy Birthday! Yum – tortilla soup is one of my favorites! “Left overs are a gift that keep on giving!” LOL I totally agree! Oh how I love tortilla soup! This looks fantastic! It is ridiculously cold here right now. All I want is comfort food, just like this soup. 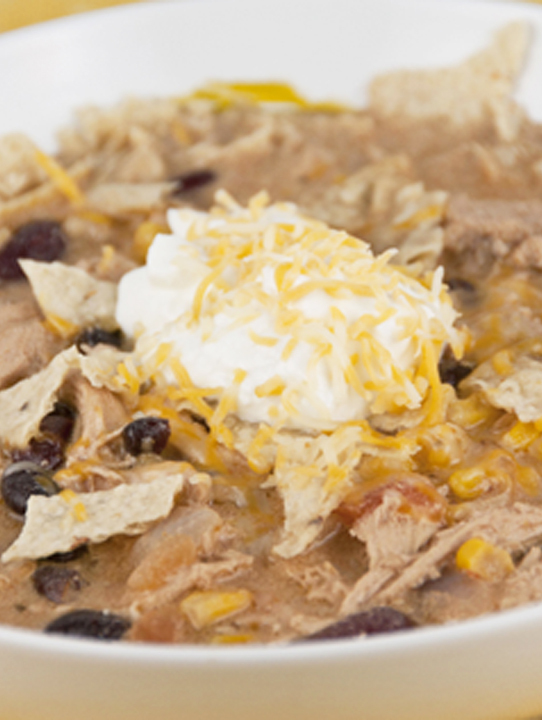 I love the crunchiness of the gorillas in this chicken tortilla soup. Great sensation and texture. I have vowed to stop eating out as often as well. This soup looks perfect for making at home cooking fast and easy! I came across your posting yesterday while I was at work. I put together a shopping list, picked up the few ingredients I was missing (I already had most of the beans/broth etc in my pantry! ), and made this as soon as I got home. It was DELICIOUS!!!! My mother in law stopped over unexpectedly, and she joined us for dinner….. she must have asked me for the recipe 4 times! Easy, flavorful, and made plenty to go around. Thank you so much for sharing 🙂 This one’s a keeper, for sure!!! Nicole, I appreciate you coming back to let me know! I’m so glad you like it!! Thank you! Happy Birthday! This looks wonderful!